We have made it to Whitehorse, Yukon (minus 30 km....)! It has been an incredible ride, with many trials and tribulations, but we have have made it nonetheless. Unfortunately, about 30 km before Whitehorse Glenn took a tumble on his bike, and his knee is sore and swollen, so we had to hitch a ride into Whitehorse and are now staying with our warm showers hosts...hopefully for a couple of days so that Glenn can recover. The scenery has been absolutely breathtaking. The mountains, the rivers, the forests....it is all incredible, and we feel so fortunate to be passing through this part of the world at such a slow pace and soaking it all in! Although for most of the ride water has been abundant, for about three or four days we were riding through lowlands in the boreal forest and the streams and bogs were looking pretty mucky...so for these few days our main focus became finding water. We ended up stocking up on water a few times and adding a lot of weight to our bikes...ick....but no dehydration is a good good thing! So food has been pretty expensive in Alaska and the Yukon...so much so that it eats up pretty much our whole daily budget just to eat. And we have not been having the most incredible meals. Vegetables are scare and anything marginally healthy is also pretty scarce....so we decided to look up edible plants and were reminded that dandelions are edible, so we have been cooking with them a little to add some nutrition ( we think of our foraging expert friend Liz when we do). We also had some major luck one afternoon when we happened upon an abandonned lodge and discovered that their store room was left unlocked...and filled with stuff! We scavenged sugar, jam and honey packets, ziplock bags, salt, garbage bags, coffee ( which turned out to be bad) and the prize item half a bottle of tequila!!!!! Scavenging and foraging is super awesome when you are on a budget in the north! We've finally seen our first bears, and Grizzlies at that! First, we were planning on stopping for lunch at a campground called Congdon Creek, which for some reason has been established in the middle of an important foraging area for Grizzly bears. We were reading a sign in the campground that explains that the most dangerous time is mid-July onwards, so we thought we'd be fine, but then an SUV pulled up with people motioning for us to leave and a few seconds later two Grizzlies ran right past us! We decided to follow the SUV out of the park and find somewhere else to eat. Then the next day Glenn spotted a Grizzly in the ditch beside the road. We stopped, and the bear stood up and looked at us. It made a kind of hissing noise then took off for the woods. Following it were two adorable little cubs! Once it was in the trees it took one more look at us, hissed again and then was gone. For the first part of this leg the wind was not much of an issue... a little headwind here and there, but nothing too bad. Well, once into the Yukon things changed drastically. The wind became more and more fierce as we headed southeast. We were averaging about 12 km an hour, if we were lucky. We were even looking forward to climbing hills, because at least they blocked the wind a little. This lasted for about 5 days, and we soon found out that this section of road is notorious for strong winds...at the centre of it is the aptly named village of Destruction Bay...where we broke down and stayed at a motel for the night to recover a bit. These winds come off of a glacier and are funnelled through the valley between the two mountain ranges...where the road also happens to be. We were really lucky one day to meet another touring cyclist Pat, we were able to take turns riding out front to lighten the brunt of the wind a bit! Cycling against wind for this long is pretty demoralizing, but it sure makes you appreciate calm days or even a tailwind a huge amount! So you're probably wondering what happened with Glenn's tumble... and his knee, which we are currently waiting to heal. Well, let this be a lesson not to fool around on loaded bikes. I was biking in front on Glenn and he close behind me. We often ride close behind one another, especially if there is a strong headwind... Anyways, today we decided to show eachother, for fun, how annoying it was to ride behind the other person... because of thier unexpected twists and turns. Well, I twisted a bit and Glenn's wheel caught on mine and he went over... eeek!! We rested on the side of the road and treated it with some arnica and traumeel before trying to ride again, it turned out that his knee was too sore for riding so we hitched a ride for the last 30 km into town. A nice young guy with his daughter picked us up almost right away and gave us a lift to our warmshowers hosts place. 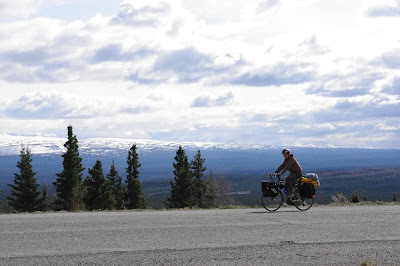 So, hopefully his knee will heel quickly, but we will give it a few days here in Whitehorse to recover, before we set out on the next 1300 km of this leg.